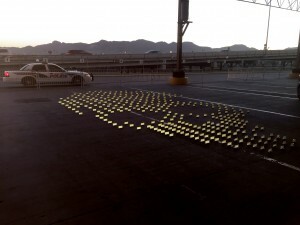 Flash Installation occupies an infrastructural artifact on the US/Mexico border. 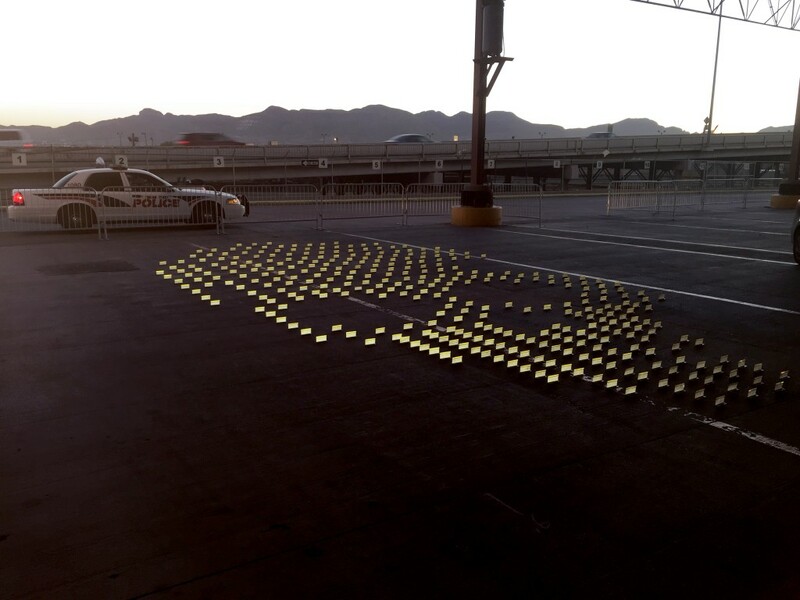 AGENCY Principals Ersela Kripa and Stephen Mueller directed students at TTU-El Paso to realize Flash Installation, a temporary event space occupying an underused transit canopy near the El Paso / Ciudad Juarez border. 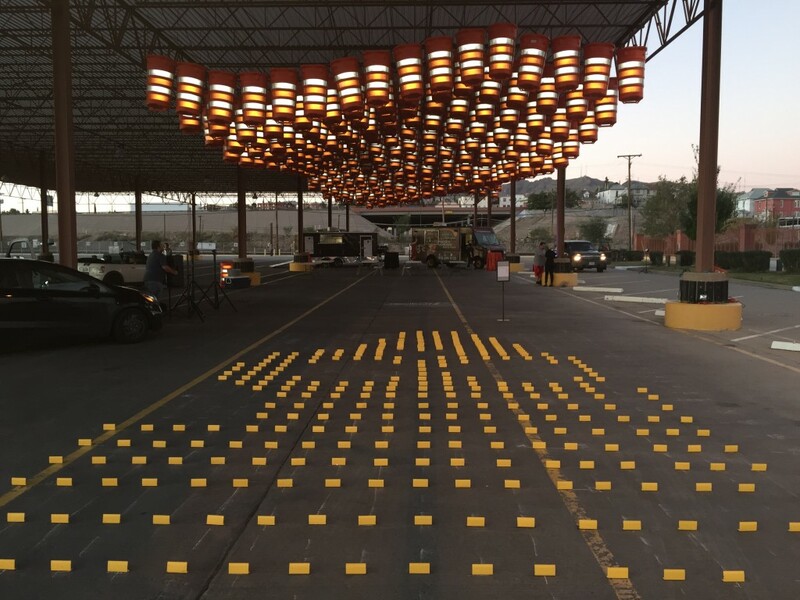 The project repurposes hundreds of standard roadway barrier barrels to create a suspended, reflective cloud beneath the steel canopy. The installation effectively humanizes the expansive infrastructure, signaling new uses for a one-night event and future explorations of life under the canopy. 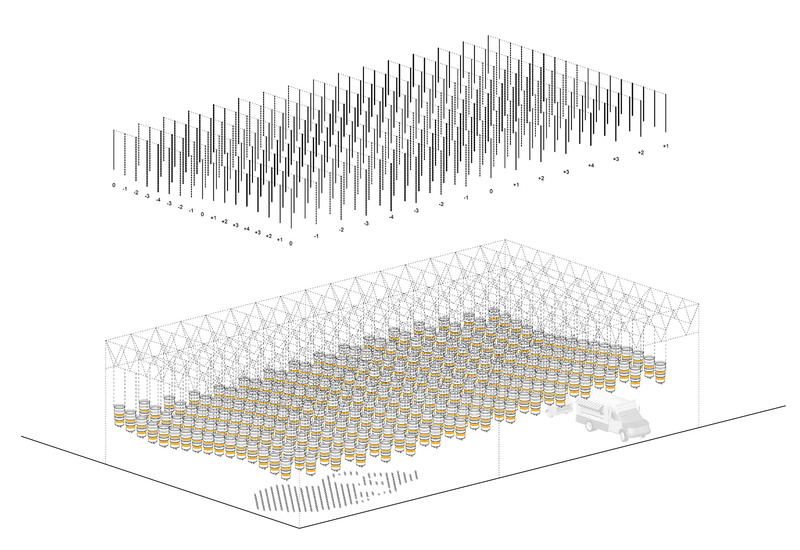 The barrel cloud creates a visual and acoustic ceiling for a dance floor and food trucks, mitigating the human scale of inhabitation with the infrastructural scale of the canopy space and repurposed objects. The installation was radically short-lived, with all construction and de-installation taking place in a twenty-four hour timeframe. 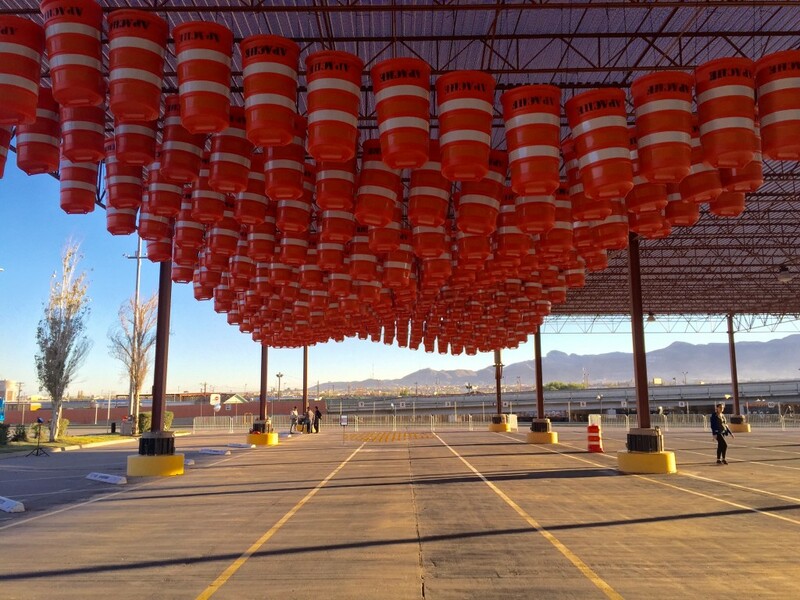 The barrels were dismounted and returned to the barrier supplier the morning after the event. They are now back in commission as roadway barriers city-wide. 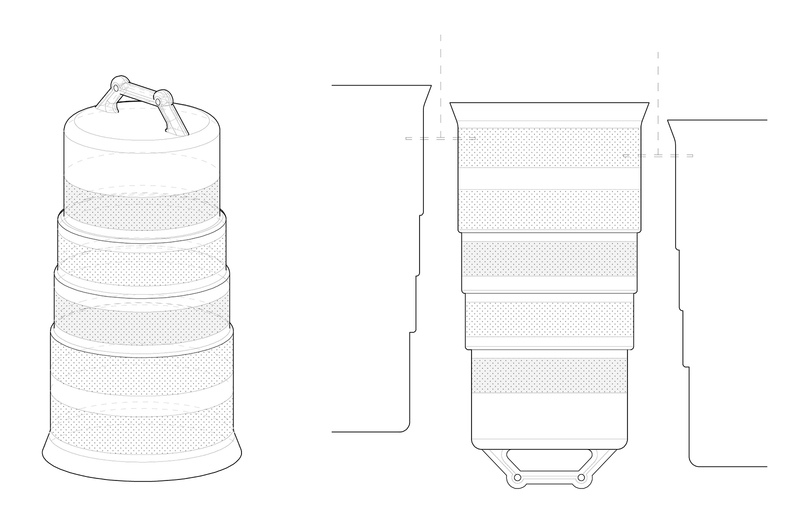 AGENCY recognized that the barrels, which are readily available for temporary rental at minimal cost, would provide the ideal ‘found material’ for transforming the superscaled space. The barrels themselves are extremely light and easily manipulated into a variety of positions. 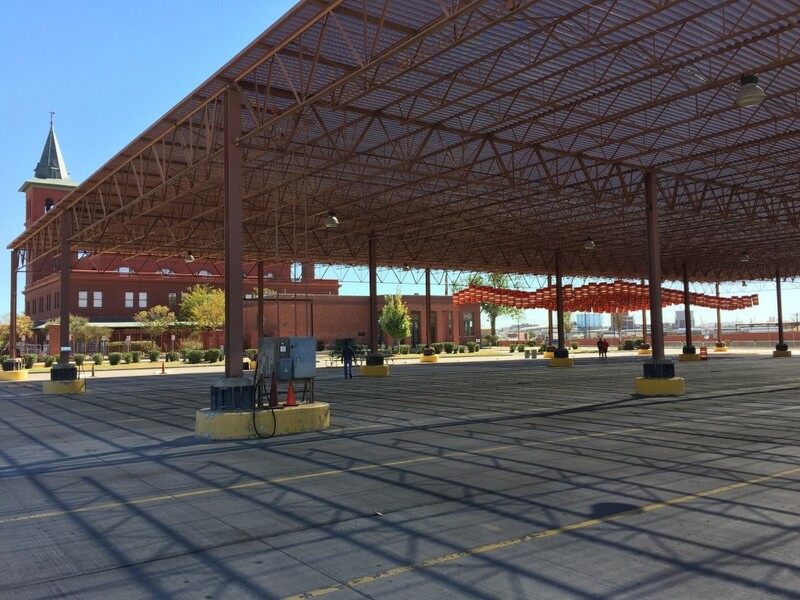 But they are also highly volumetric, providing minimal structural impact on the existing canopy while maximizing the visual presence. 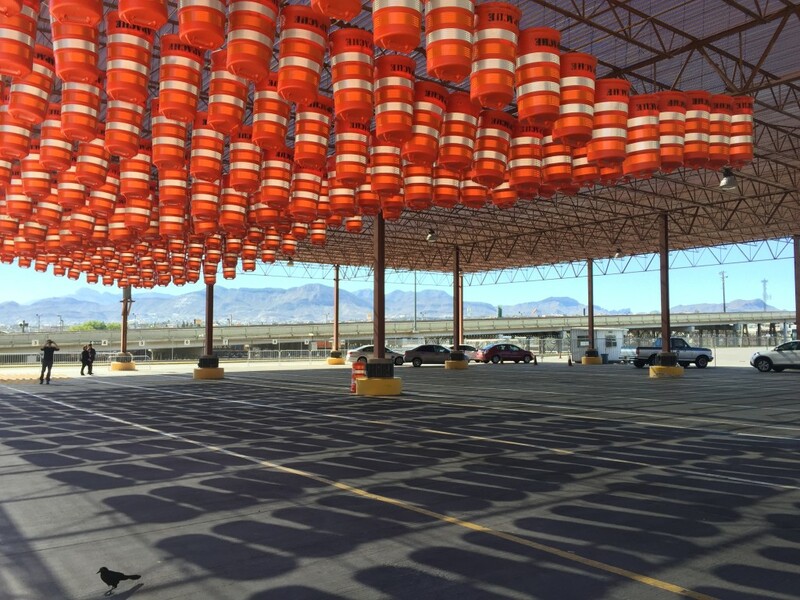 Multiplied in 16 rows and 16 columns, the barrels define their own topography, echoing the lines of the distant mountains. 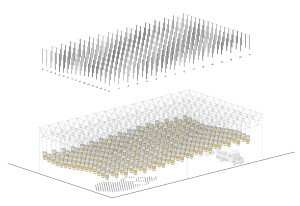 The new suspended ceiling defines zones of intensity and intimacy below the superstructure. 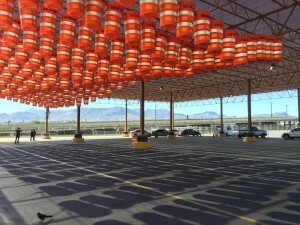 The barrels also come ready-made with a large surface area of bichromatic reflective tape, which AGENCY used to activate the installation visually. 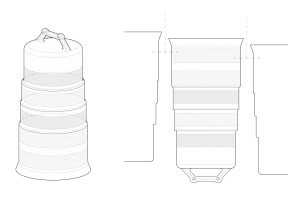 The barrel cloud takes on new life, creating atmospheric lighting effects as it interacts with dappled sunlight, passing headlights, event lighting, and flash photography. To complement the aerial installation, a secondary element was installed on the parking lot surface itself. Composed of 300 flexible roadway reflectors, the ground pattern is calibrated to form an anamorphic image. 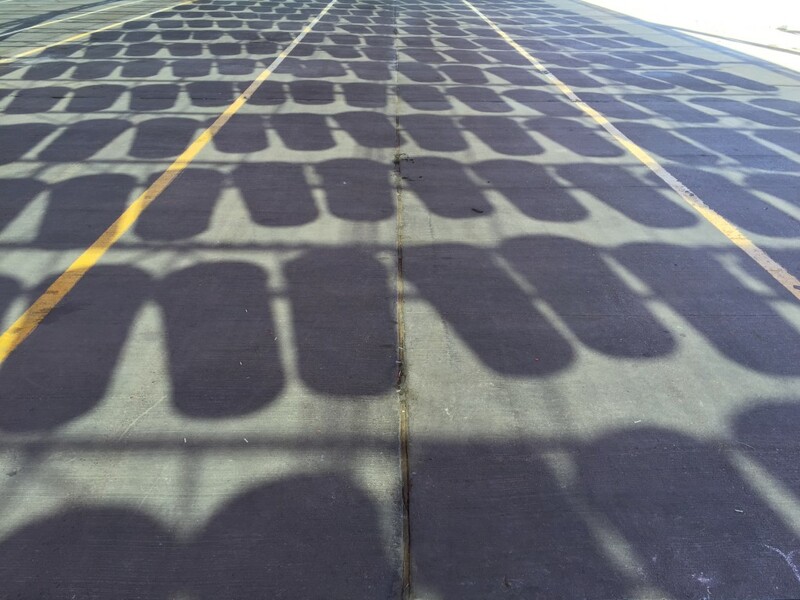 When viewed from a particular angle, the seemingly randomly placed reflectors are recomposed as pixels of a recognizable image. 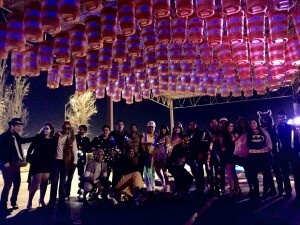 The installation provided the backdrop for the annual Beaux Arts Ball, an annual costume ball sponsored by TTU College of Architecture which seeks to enrich the design culture of the City of El Paso. Proceeds from event sales and donations benefited the school’s chapter of AIAS (American Institute of Architectural Students). 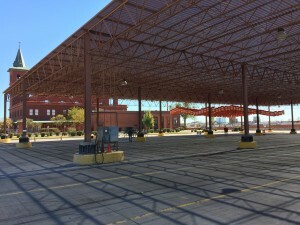 The project seeks to open dialogue with the city and the school to imagine new uses for the underutilized canopy space.